The Old Republic still doesn't have an official release date, but you can start finding potential guildmates right now. If players are the lifeblood of any MMO, then guilds are the blood vessels. Guilds are great: They're a chatroom and social circle for when you're off questing on your own, they're a group of comrades to accompany you into dungeons and raids, and many in-game guilds form lasting real-world friendships. 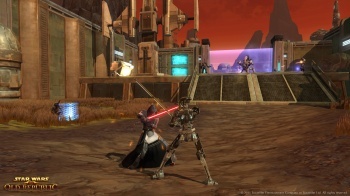 Naturally, Star Wars: The Old Republic will support player guilds - and BioWare has taken the interesting step of allowing its players to register guilds well before the game's release (or rather, well before it even has a release date). This means that players will get to reserve a guild name long before the servers go live, so you don't need to worry about some jerk taking [And Two Stealthed Rogues Sith Assassins] before you get to register it in-game. There's a comprehensive FAQ on the SWTOR site, but it all seems fairly straightforward: Register your guild name and your server preference (PvE, PvP, or RP), and start recruiting! At some point in the future, you'll be able to select up to three same-faction guilds as your guild's Allies, and up to three enemy-faction guilds as your guild's Adversaries - and BioWare will try to make sure you all end up on the same server together. It's a pretty convenient program in itself, but I really like the sound of that last bit. MMO launches are a bit chaotic if you haven't planned things out with your buddies - and it's a pain having to reroll your level 15 character just because you found out your good friend had a level 30 character on another server. This way, BioWare seems to be hoping to get that particular headache out of the way well before launch, so it can deal with all of the other headaches that come with a brand-new MMO. If this appeals to you, check out the Guild FAQ over at SWTOR ... you Imperial scum (or alternatively, you valiant Republic warriors).